FROM CREAMY CANS OF NITRO COFFEE TO ENERGY SUSTAINING TEAS, PRODUCERS OF GRAB-AND-GO BEVERAGES ARE WORKING TO QUENCH CONSUMERS’ THIRST WHILE FULFILLING LIFESTYLE NEEDS. Specialty food consumers are hitting the refrigerated aisle hard. “With craft bottlers leading the push away from national brands, RTD is a category that is flourishing, showing healthy growth year after year, and offering consumers—especially millennials and Gen Xers—variety in both format, flavor, and even packaging,” says Michael Meinhardt, general manager, Meinhardt Fine Foods, Vancouver, B.C. According to the Specialty Food Association’s “State of the Specialty Food Industry 2018” report, specialty beverage sales hit $11.7 billion in 2017—which amounts to about 18 percent of the total specialty retail market. Between 2015 and 2017, beverages grew 18 percent. The refrigerated RTD tea and coffee category made up a big part of that increase—up a whopping 63.2 percent in dollar sales and 65.1 percent in unit sales during the same period. RTD tea is thriving. According to Mintel’s “Tea & RTD Tea US August 2017” report, RTD leads the tea category, representing more than half of dollar sales. The segment, which delivers on convenience and variety for time-strapped, thirsty consumers, is also responsible for the lion’s share of gains, growing 29 percent from 2012 to 2017. While 79 percent of U.S. adults drink tea, 60 percent drink RTD options such as low-calorie, varieties mixed with juice or herbs, and those that are effervescent or fermented such as kombucha. Taste, convenience, price, thirst quench, and health- and energy-boosting claims also drive purchases. RTD coffee is also popular at home. According to Mintel’s “US Coffee Industry July 2017” report, 83 percent of adults drink some type of coffee at home, with 46 percent consuming RTD coffee drinks in bottles or cans and multi-serve refrigerated ready-to-drinks in bottles or cartons. Both large and small players are moving beyond generic ingredients, understanding that customers can be very selective. Some consumers seek out cane sugar over fructose (especially in teas), opt for non-traditional flavor profiles and fair trade or organic varieties, and seek out reusable packaging options like mason jars. Here are noteworthy trends to keep an eye on. Cold brew innovation. Total U.S. retail sales of refrigerated cold brew coffee grew 460 percent from 2015 to 2017, according to Mintel. Category leaders like Stumptown Coffee Roasters and La Colombe Coffee Roasters and some lesser knowns such as Rise Brewing Co. and Sail Away Coffee, are innovating within the segment, moving from the traditional bottle to a can and adding flavors, carbonation, and even nitrogen to the drinks. “RTD nitro cold brews [which pour similarly to Guinness] have a craft appeal and a creamy mouth-feel,” notes Rob Craig, beverage technologist, Synergy Flavors, a global manufacturer and supplier of flavorings, extracts, and essences. “They, and the hype around them, are definitely here to stay.” Companies that want to stand out in the nitro category, says Craig, will incorporate spicy and floral flavors to their brews. At Wheatsville Food Co-op in Austin, Texas, where RTD has been growing 25 percent year over year, packaged manager Niki Nash says cold brews are going strong with local newcomer Cuvée Coffee piquing interest with its canned nitro black coffee. But cold brew isn’t just for coffee and is slowly picking up momentum in the tea segment. According to “The State of the U.S. Tea Industry 2017-18 Tea Market Review & Forecast” from the Tea Association of the U.S.A., cold brewed iced teas will be a key area of growth, showcasing mellower flavor profiles. “While cold brewed coffee has a significant taste differentiation, it is much less noticeable in tea,” says Angela Lantman, applications manager at Synergy Flavors, who notes that so far, Synergy has had “few requests” for cold brew tea. Bubbles. While it’s all about creating selection, tea and coffee industry insiders are on the fence about some characteristics. Specifically, carbonation, one of the newer trends some producers are starting to implement in their brews. “Carbonating coffee is difficult—especially to maintain a good flavor profile—because it lowers the pH,” says Lantman, who notes coffee tastes better with a higher pH. But some coffee companies are taking the lead with carbonating their cold brews and not only bubbling it up, but also adding some interesting flavors. “Stumptown is one of the companies really dialing into the category, creating selection and choice for the customer,” notes Meinhardt. 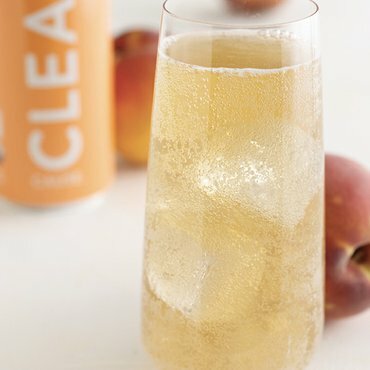 The company recently debuted a sparkling cold brew in a can in Original, Honey Lemon, and Ginger Citrus, that has about half the caffeine of its original cold brew and is made with natural cane sugar. Focusing on function. As more consumers, especially millennials, expand their search for good, clean, healthy options, many are seeking out other sources of energy. “Customers who don’t want the crash-and-burn effect are gravitating toward yerba mate,” says Wheatsville’s Nash. “It’s dominating the category for us—unlike sparkling coffees, which have not been very well received.” Nash says customer favorites are Clean Cause Sparkling Yerba Mate, and Guayaki Sparkling Organic Yerba Mate. “Shoppers are also being drawn to yerba mate’s powerful nutrient profile,” says Carl Pennington, president and CEO of Impact Group, a sales and marketing agency that helps CPG brands understand the best path to market. “Unlike coffee, yerba mate improves your state of alertness without interfering with sleep or causing caffeine jitters,” he adds. Pennington says of the six commonly used stimulants in the world—coffee, tea, yerba mate, kola nut, cocoa, and guarana—yerba mate is the most balanced, delivering both energy and nutrition. Stress-reducing ingredients like adaptogens (think medicinal herbs like moringa and tulsi), medicinal mushrooms, and CBD (cannabidiol) are also making news. Touted for supporting energy and mood and promoting a mind-body connection, these ingredients—along with prebiotics for intestinal health—will become increasingly popular according to SPINS Top 10 Trends Predictions 2018. While kombucha has been the pioneering product in this lifestyle space, the category has branched out to include other functional drinks such as coffee and tea. Protein-infused coffees particularly, according to market research provider, Euromonitor International’s “RTD Tea US 2018,” are becoming more popular and will provide premiumization to the category. Mollie Bunnell-Jewett, demo coordinator, Woodstock Farmers’ Market, Woodstock, Vt., who has seen functional take the lead in growth in RTD, says the biggest consumer of functional teas/coffees are shoppers in their late teens to 20-somethings (millennials and Gen Zers), with CBD tea leading interest. “Kimball Brook Farm Organic CBD Green Tea with Mint is flying off the shelves,” she says. The tea contains 25 mg of cannabidiol (a non-psychoactive oil used for its analgesic and anti-inflammatory properties that comes from hemp raised in Vermont). Up-and-coming flavors and ingredients. Many combinations vie for shelf space. Producers are innovating by pairing a familiar flavor with a lesser-known option, using juice to cut back on sugar, and finding a superfood ingredient that offers some type of functionality. “Fair Trade cocoa, coconut oil, matcha, turmeric, and alternative sweeteners such as monk fruit, stevia, and coconut sugar are some of the latest healthful ingredients being added to functional RTD coffee and teas,” says Katie Strohbeck, executive director of Growth Solutions, KeHE Distributors. At Synergy, turmeric and white tea is “definitely trending up,” in the tea category, notes Lantman. She says familiar and popular flavors like peach, lemon, raspberry, and strawberry are strong but are being paired with herbals like basil to elevate flavor profiles and give more variety. In the coffee space, especially cold brews, Craig says requests have been coming in for the addition of whey, pea, and rice protein. But flavorwise, while mocha, vanilla, and hazelnut remain popular, those wanting an edge in the market are adding more specialty flavors like whiskey, oak, florals, and cardamom. More varietal teas, bottled turmeric lattes possibly originating from coffee houses dabbling in the RTD space, and more blurring of category lines (think more juiced-up teas and protein-fueled cold brews) are all in store for the RTD coffee and tea category. “Consumers will keep trading up as they seek new variety and products that fit their needs,” Lantman notes. Yet, while it might seem more cost effective to purchase a RTD beverage than going to a niche coffee house, some retailers say prices for both tea and coffee could pigeonhole future sales. And, with cold brew becoming a quality marker for other applications (it already can be seen morphing into a flavor profile characterizing everything from chocolate and ice cream to protein bars), Kara Nielsen, vice president, trends and marketing at CCD Innovation, says we could see some dilution within the category. “Consumers might be more concerned with getting their cold brew fix in other places than the RTD aisle, raising the question, ‘could too much choice be a bad thing?” she says.